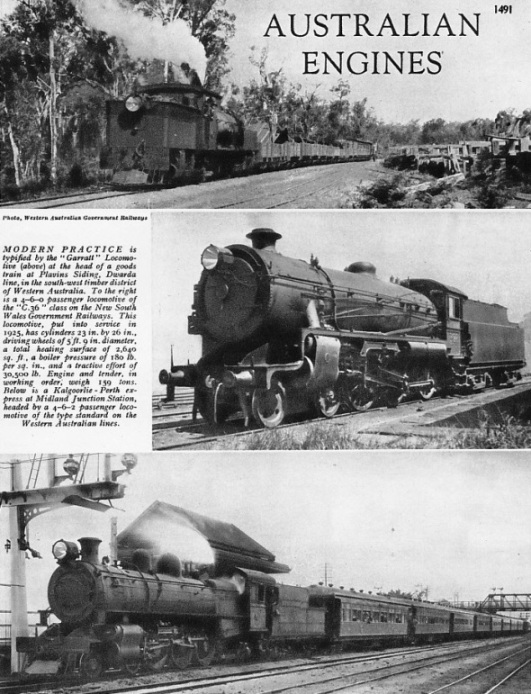 (Top) MODERN PRACTICE is typified by the “Garratt” locomotive at the head of a goods train at Plavins Siding, Dwarda line, in the south-west timber district of Western Australia. 5 ft 9 in diameter, a total heating service of 2,640 sq ft, a boiler pressure of 180 lb per sq in, and a tractive effort of 30,500 lb. Engine and tender, in working order, weigh 159 tons. (Bottom) A Kalgoorlie-Perth express at Midland Junction Station, headed by a 4-6-2 passenger locomotive of the type standard on the Western Australian Lines. (Top left) A2 CLASS LOCOMOTIVE. The principal dimensions of this 4-6-0 engine are: diameter of driving wheels, 6 ft; cylinders, 22 in by 26 in; boiler pressure, 185 lb per sq in; tractive effort at 80 per cent boiler pressure, 25, 867 lb; heating surface, firebox 145 sq ft, flues and tubes 1,568 sq ft, superheater 331 sq ft, total 2,044 sq ft; grate area, 29 sq ft. The length overall is 62 ft 6½ in. Tender capacity is water 4,600 gallons, fuel 6½ tons. The weight on coupled wheels in working order is 52 tons 2 cwt. Total weight of engine and tender, empty, is 85 tons 7 cwt, and in working order 118 tons 2 cwt. The locomotive was designed by the Chief Mechanical Engineer, Victorian Government Railways, and built at the Government Railway Workshops, Newport, Victoria, Australia. (Bottom left) “S” CLASS LOCOMOTIVE built at the Newport Workshops for the Victorian Railways. The leading dimensions of this “Pacific” are: three cylinders, 20½ in by 28 in; diameter of coupled wheels, 6 ft; total heating surface, 3,736 sq ft; boiler pressure, 200 lb per sq in; and tractive effort, 41,000 lb. The weight of engine and tender in working order is 194 tons 13 cwt, while the adhesive weight is 70 tons 5 cwt. The tender has a water capacity of 8,600 gallons and space for 9 tons of fuel. (Centre) USED BY THE VICTORIAN RAILWAYS on the narrow-gauge lines at Walhalla and Beech Forest. This “Garratt” locomotive (2-6-0+0-6-2) has the following dimensions: diameter of driving wheels, 3 ft; cylinders 13¼ in by 18 in; heating surface, firebox 99 sq ft, flues and tubes 950 sq ft, superheater 181 sq ft, total 1,230 sq ft; grate area, 22.6 sq ft. The tractive effort at 80 per cent boiler pressure is 25,270 lb; boiler pressure is 180 lb; tender capacity, water 1,680 gallons, fuel 3½ tons; and total weight, empty, 54 tons 6 cwt, and in working order, 69 tons 1 cwt. The length overall is 51 ft 8 in approximately. 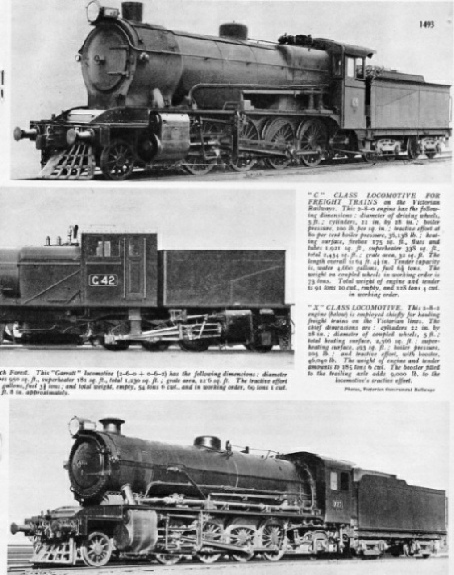 (Top right) “C” CLASS LOCOMOTIVE FOR FREIGHT TRAINS on the Victorian Railways. This 2-8-0 engine has the following dimensions: diameter of driving wheels, 5 ft; cylinders 22 in by 28 in; boiler pressure 200 lb per sq in; tractive effort at 80 per cent boiler pressure, 36,138 lb; heating surface, firebox 175 sq ft, flues and tubes 1,921 sq ft, superheater 338 sq ft, total 2,434 sq ft; grate area, 32 sq ft. The length overall is 64 ft 4½ in. Tender capacity is, water 4,660 gallons, fuel 6½ tons. The weight on coupled wheels in working order is 73 tons. Total weight of engine and tender is 91 tons 10 cwt empty, and 128 tons 4 cwt in working order. 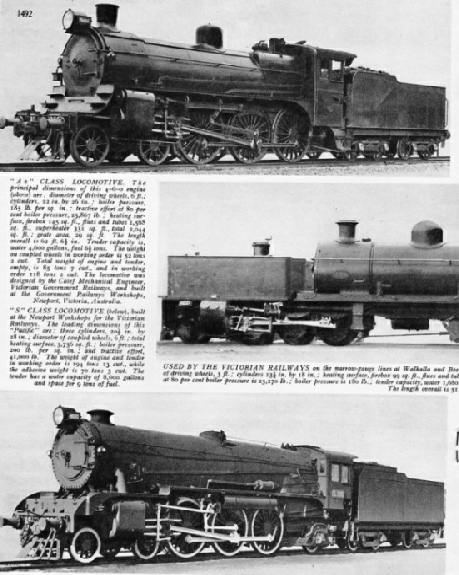 (Bottom right) “X” CLASS LOCOMOTIVE. This 2-8-2 engine is employed chiefly for hauling freight trains on the Victorian lines. The chief dimensions are: cylinders 22 in by 28 in; diameter of coupled wheels, 5 ft; total heating surface, 2,566 sq ft; superheating surface, 493 sq ft; boiler pressure 205 lb ; and tractive effort, with booster, 46,040 lb. The weight of engine and tender amounts to 185 tons 6 cwt. The booster fitted to the trailing axle adds 9,000 lb to the locomotive’s tractive effort. 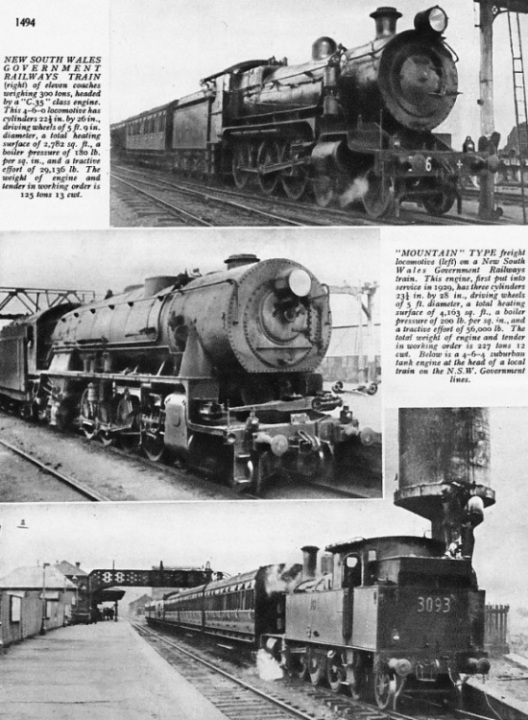 (Top) New South Wales Government Railways train of eleven coaches weighing 300 tons, headed by a “C.35” class engine. This 4-6-0 locomotive has cylinders 22½ in by 26 in, driving wheels of 5 ft 9 in diameter, a total heating surface of 2,782 sq ft, a boiler pressure of 180 lb per sq in, and a tractive effort of 23,196 lb. The weight of engine and tender in working order is 125 tons 13 cwt. (Middle) “Mountain” type freight locomotive on a New South Wales Government Railways train. This engine, first put into service in 1929, has three cylinders 23 ¼in by 28 in, driving wheels of 5 ft diameter, a total heating surface of 4,163 sq ft, a boiler pressure of 200 lb per sq in, and a tractive effort of 56,000 lb. The total weight of engine and tender in working order is 227 tons 12 cwt. (Bottom) A 4-6-4 suburban tank engine at the head of a local train on the New South Wales Government lines. You can read more on “Across Australia by Train” “Electrification Overseas” and “Travel in Australia” in Railway Wonders of the World.